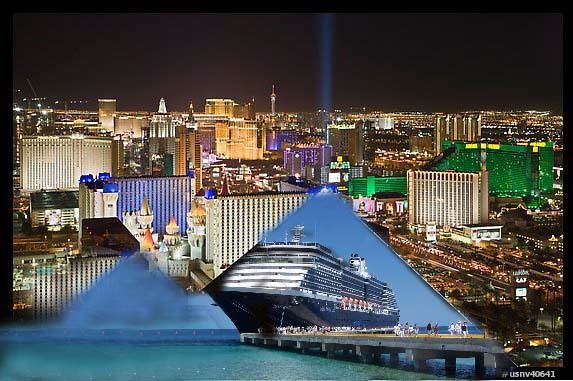 Home TravelogueHolland America Cruise Ship Docking in Las Vegas? You Bet Your Booties. A smaller ship, the Holland America- ms Westerdam excelled in all aspects of cruise life – particularly hospitality, friendly service, delicious meals and a cozy ambience that encouraged social interaction and provided passengers with plenty to occupy their time beyond the casinos and on board shopping. As our crew of eighteen were always on the prowl for interesting ship board adventures, it did not take long before smaller groups of six turned a simple game of Trivial Pursuit or a Scavenger Hunt into a competitive event that rivaled anything the Olympics had to offer. After earning a plethora of Gold and Silver medals, one group was shunted aside for urinalysis. Of the group (link here), only one couple came back clean that being Jim and Gloria Arnott. Unfortunately, the Dunn’s (Esther and Garth) and Castles (Doug and Patty) tested positive for high levels of that skill enhancing liquid commonly referred to as ‘alcohol.’ The entire group were assessed lengthy suspensions and placed on several ‘no go lists’, by the Cruise Director. Following that suspension, afternoon Bingo became the game of choice largely because there were no substance tests. The side benefit – plenty of party cash rather than medals. Esther Dunn, Anne Skeltcher (a new recruit) and Elizabeth (aka Lib) Lohr took away a cool $270 prize the first time around while others followed up with lesser prizes. Not bad for Bingo novices from the Great White North. Early evening found everyone savouring a delectable array of food and fine wines in the dining room after which we all retired to the theatre for after dinner drinks while watching an hour or two of song, dance, comedy and magic. Still later, those of our group who enjoyed singing and dancing as a means to round out the evening, spent time at karaoke bar or on the dance floor. Herb Craig, Anne Skeltcher, Patty and Doug Castles set new standards in twist the contest while others rock and rolled their way into the wee hours of the morning. Photo: Doug Castles in during his award winning performance. You really missed something if you were not present to see the 6’ 3” Doug Castles doing a Scottish twist rendition (link here) that would rival anything a teenage fitness guru might drum up. An incredulous Patty, just stepped back as she watched Doug put more energy into that dance than a ‘fast forward’ version of the River Dance. As the delighted crowd rose to their feet, Patty checked with bar staff to see if paramedics were readily available. Could it get any better? You bet it could. Next up was that boyish septagenarian Herb Craig (link here) along with his good wife Anne. Herb and Anne’s rendition of dirty dancing, twist style, again brought the crowd to their feet. The question: would we be able to untwist the two of them? As both couples gave classic performances, they each walked away with bottles of champagne that were later shared among members of the support team. The third couple, from Nanaimo, BC completed the trifecta by dancing a bronze medal winning performance. Eight or nine more nights of this rollicking would no doubt land more than a few of our crew in traction for the duration. As this cruise originated in Vancouver, members of our group ran into dozens of other Lower Mainland and Island couples and singles we knew from other walks of our lives. Let me assure you, it would not be possible on one of these cruises to have an illicite get-a-away without running into a dozen friends of your spouse or significant other. With calm weather and a shallow fog hugging the coast of Washington State, we were able to make our scheduled stop in the historic seaside city of Astoria. The last time Lynn and I visited Astoria was in 1984. Ooh, come to think of it, that was our first illicit get-a-away before we married in late July that year. 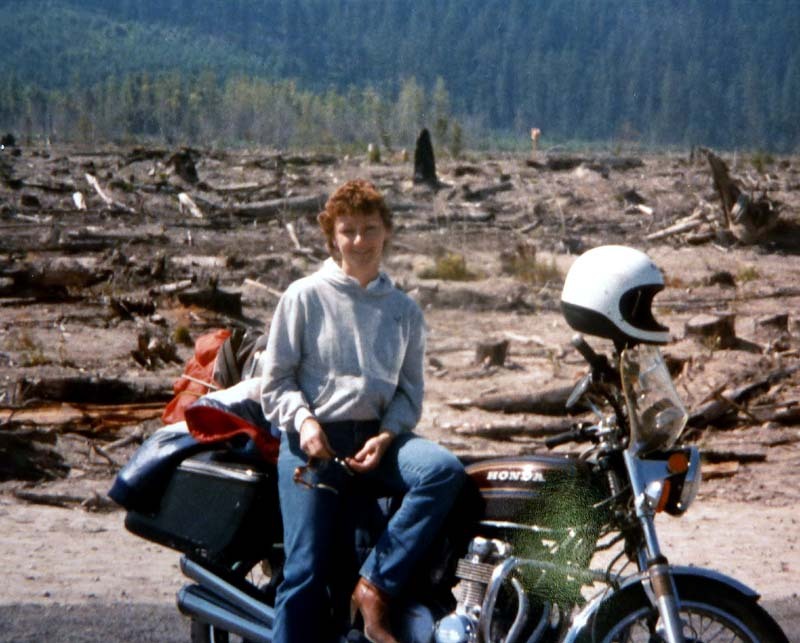 Travelling on my trusty Honda four banger, we hugged (literally) the coast of Washington (more than once), crossed the bridge that spanned the mighty Columbia River, then headed inland to the ash filled valleys of Mount St. Helen. Even four years after that epic eruption it was still astonishing to see the damage as a giant wall of mud and debris continued to flow into the valleys below leaving only the smokestacks of tractor trailers and the roofs of buildings as a reminder that people once lived and worked in this lush mountain area. In the distance thousands of acres of trees laid low by the explosion covered hillsides giving them a moonscape appearance. Photo: 1984. Another magical trip through Astoria with that young woman with whom I fell in love so many years earlier. At our cruise stop in Astoria, Herb, Anne, Lynn and I managed to find a classic winery (Shallon Winery) obout which I shall write a separate post as the eighty something eccentric vintner who exactingly explained the background of several wines he developed over the decades, is a story well worth telling. At the same stop, and in another episode of the ‘small world concept’ , we met a couple from Lloydminster, SK, who, you guessed it, were close friends of my first cousin in Lloydminster, Barb (nee Crocker) and husband Wayne (Russell). In Astoria, our first stop in the good old US of A, our new Aussie friends, John and Rosalie Gold learned very quickly that Australians are probably more like Americans than Americans. Contrasted with that was a couple from New Zealand, who we met on board, who were more like Canadians than Canadians..hmm. With our motly crew all having headed in different directions in Astoria, it was not until late that evening when we all gathered for dinner that we learned no one had been detained for rowdy behaviour in any of the local bars or held by that Homeland group for some security breach. We sleep all night and we work all day. If we had access to a few tattered RCMP Red Serge tunics, there is little doubt we would have gone viral on U tube and gained feature show status at our various stops. Next time around we shall go with the red serge. Monty Python eat your heart out. With our ship parked in the heart of San Diego we dutifully boarded the bus for transfer to our hotel. After a twenty minute wait while waiting for six passengers who, as it turned out decided to walk, we drove for twenty minutes in order to complete a detour around road construction taking place along the waterfront. You guessed it; our hotel was directly across the street from the Westerdam, a short half block walk. After a good chuckle we settled in for what would turn out to be another three and one-half fun-filled days. 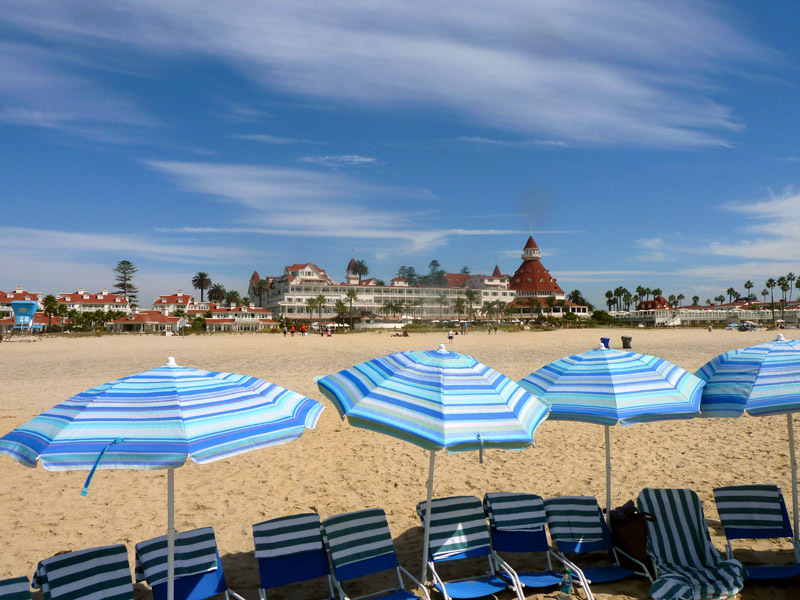 Our central waterfront location provided easy access to the best that San Diego had to offer: Coronado Island, the Del Coronado Hotel and Coronado Beach (link here) (a short ferry ride across the bay), Balboa Park and the San Diego Zoo, a hop, skip and jump to the north-east. The Old Town which provided a glimpse into the past was just a 20 minute walk that passed through the Italian Quarter, an area alive with food, music and entertainment. Then, of course, the former (and very popular) Red Light District where tousands of sailors stationed at the San Diego Naval Training Base, and location of the Pacific Fleet ,would spend a little recreational time and most of their pay. Gossip has it that during his youthful years in the Royal Canadian Navy, Herbert Craig, had been confined after that Captain realized it would be dangerous to let him loose on an innocent city such as San Diego. Well, since Herb left, the area has been revitalized with dozens of shops and memorabilia that celebrate that interesting history. On a clear day, from the top floor of our hotel, you can see into Mexico and the famous city of Tijuana, a short bus ride south. A short walk along the waterfront in that direction took us past several cruise ships that surrounded the US Aircraft Carrier, Midway, (link here) commisioned right after the second world war and now a waterfront museum (currently the cover photo on my Facebook Timeline). At the end of the walkway was the trendy waterfront shopping area – Seaport Village. There were clearly more interesting things to see and do than could possibly be stuffed into the time we had alloted, however it is certain that among the eighteen of our energetic group, we touched a good number. Our last evening found us returning to the Prado Restaurant in Balboa Park before attending the premiere of the musical Allegiance at the Globe Theatre. We would certainly recommend the Prado as a delightful place to enjoy a meal before the theatre which was just a half block away along the beautiful El Prada Way. Photo: Taken on El Prada Way just across from the El Prado Restaurant. 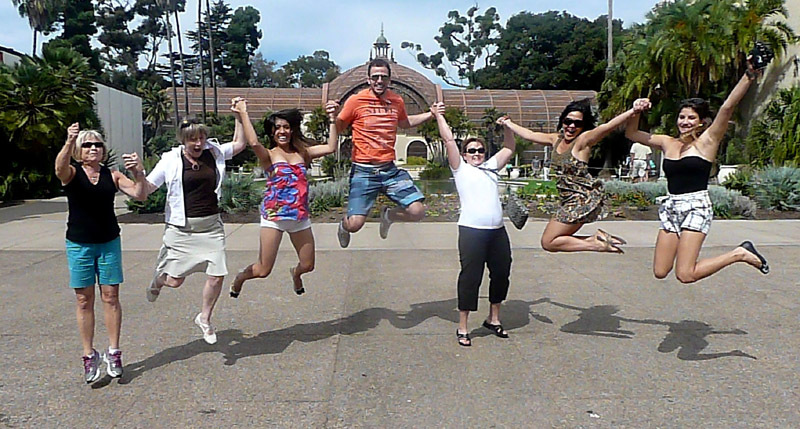 Here Ann, Lynn and Esther join four young Brazilians in another of our jump shots (more photos in the links below). While Lynn almost completed a ‘header’ in this shot, in another (missed) photo opportunity on Coronado Beach, Esther managed to do a pirouette into the surging surf. We are hopeful the young people (among others we have met on various trips) will make contact and help pave our way to Brazil for the 2014 World Cup. As for the musical production, Allegiance, it seems clear this production is destined to become a Broadway hit. Using an intricately woven combination of music, song, dance and dialogue in flashback form, the production traces the internment experience of Japanese Americans after having had all their property and assets seized shortly after the Japanese attack on Pearl Harbour. It was a particularly poignant portrayal as it traced not only the feelings of resentment felt by Japanese, many of whom were second and third generation American, it also revealed the extreme conflicts that developed within the community itself as the internees sought to reconcile life in their new reality. Given the strong emotions developed in the United States and many countries of the post 911 world, it seems clear the next set of immigrants are only one heart beat (or bomb) away from being the next targeted group as were the Italians, Scottish, Irish, Catholics, etc., in generations gone by. It was my impression the production was very daring in a world that seeks to demonize people for no other reason than an ethnic connection to another part of the world or to an unpopular religion. As with many hundreds of other places around the world, San Diego is a must see if even for only the few days scheduled on our tour. Again, as it was after our stop in Astoria, all members of our crew managed to arrive on time (and in reasonable shape) to catch our flight to Las Vegas, the last stop on our whirlwind tour. While Vegas is certainly a wonderland of make believe, it does offer many unique experiences for those who care not a whit about smoke filled gambling casinos, but, instead, prefer to spend a day walking while seeking out new adventures and meeting all kinds of interesting people from around the world. The two sides of the Vegas strip present entirely different worlds with one side filled with affluence, the other street filled with hustlers, as individuals attempt to make a meager living by selling things a person does not need but, in many cases, cannot resist (link here). That person to person hustle is mostly absent on the other side of the strip where affluence rules the walkways. While many things such as prostitution are illegal, you would never know it by the number of ‘calling cards’ offered to every passing male and female walking together. In that regard, Vegas is a gender equity city. 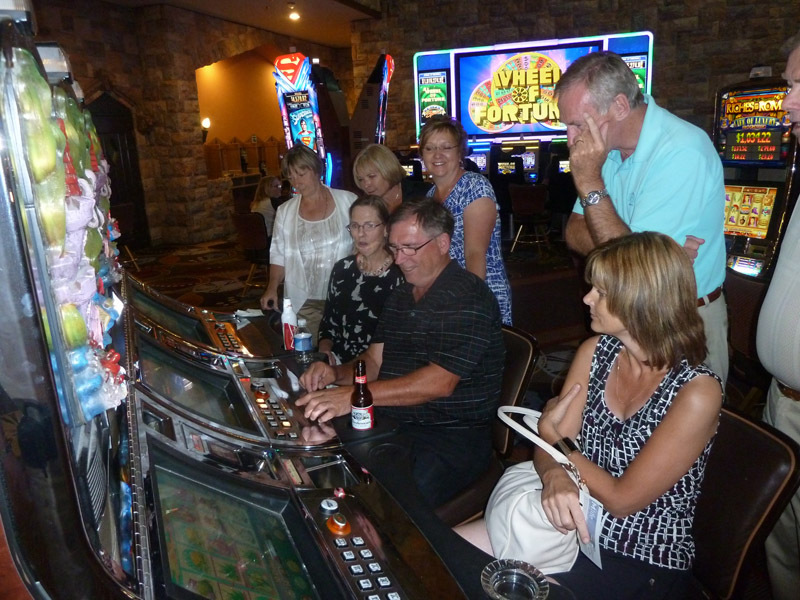 Photo: In order to fulfill the urge to gamble, these members of our crew (Lynn, Ann, Esther, Doug, Patty, Larry and I) combined our funds ($1.00 each) in order to play the penny slot. Here Larry is tasked with the onerous job of pushing the button. I think we managed to break even and in Las Vegas that is as good as a win. Another oxymoron is the gambling age (link here). Large signs indicate that everyone under the age of twenty-one is prohibited from gambling, but gambling casinos must somehow interpret this law in a different manner. Our hotel had an entire lower section dedicated to children and teens. Bowling, pin ball and hundreds of other machines designed very similar to the adult slots, offered up all manner of prizes and points that could be converted to prizes. Parents and children as young as five or six carrying plastic toys, dolls and various other prizes, lined up to take a turn on one of those machines of chance that seemed to be ‘paying off’. For our group a six hour walk-a-bout along the strip provided ample entertainment and many extremely interesting displays of art work, and buildings designed as replicas (link here) of various highlights from around the world. Even highlights including world class theatre productions such as the Jersey Boys, Donnie and Marie, Cirque de Soleil and dozens of other productions that were well worth the $80 – $100 price of admission. As for a fine dining experience, Lynn, I and others learned how to share one main course and one entrée that kept the tab at areasonable amount for a solid two hours of fun and laughter. To get away from the hustle and bustle, several of our group jumped aboard a charter helicopter ride to the Grand Canyon, an experience that Lynn and I have set aside for a future expedition to the southern states. The one adventure I did add to the list was a jump from the 108th floor of the Stratosphere Hotel at the end of the Vegas Strip (link here). That 1000 foot drop to the earth at 256 ft/sec (281 k/hr or 175 mph) took all of 8 seconds and was one of the biggest adrenalin rushes I have ever experienced. My knuckles were still white from that final moment of clinging to the tower platform before stepping off into space. As with our time in San Diego, the time in Las Vegas came all too quickly to an end as we made our way to the airport in one of the ten thousand taxi cabs that connect the city to the airport. Now a word about our favourite airline, West Jet, that friend for life carrier. We were delayed some three hours due to a mechanical problem that delayed the West Jet departure from Vancouver. Well, better to fix the potential problem on the ground than to have to find a parking spot on some cloud I always say. West Jet provided us with meal vouchers and pointed us to a friendly bar (photo left). Our West Jet receptionist at the airport helped everyone ‘ease’ into the delay by doing some modelling (see photo below). 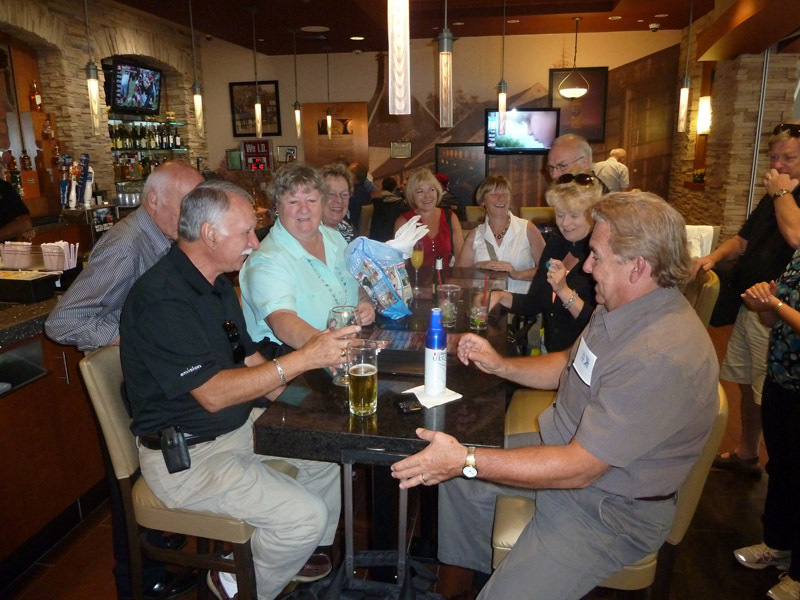 Photo (At the Airport): Here we celebrated Ron and Sandy Hall’s 40th Wedding Anniversary (Linda tipped us off). 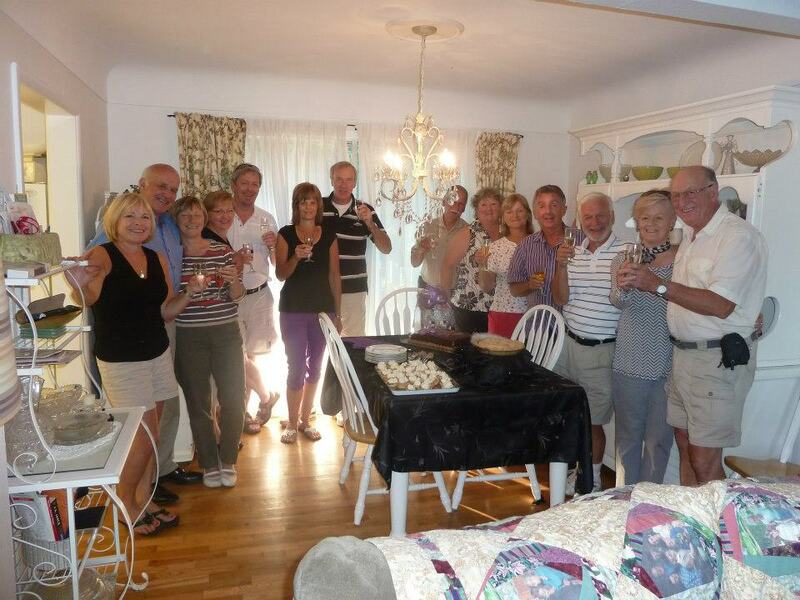 Present (from Right) Ron, Herb, Sandy, Stranger1 (drinks), Ann, Lynn, Stranger2, Linda, Garth, Bjorn (hands only) and Stranger3. As we seldom worried about ‘stranger danger’, we often encouraged them to join in our celebrations. We have found they often felt compelled to buy a round or two of drinks form the awesome, welcoming Canadians. Well, of course, we put our vouchers to good use even though West Jet specified we had to use them for food! Good luck, you were talking to resourceful Canadians. We were, however strongly encouraged to remain ambulatory for the boarding process. I figured no problem for those of us in the Senior Category as we could just fake something and apply for pre-boarding in a wheel chair. Who would even know why Harold was sleeping in a wheel chair. 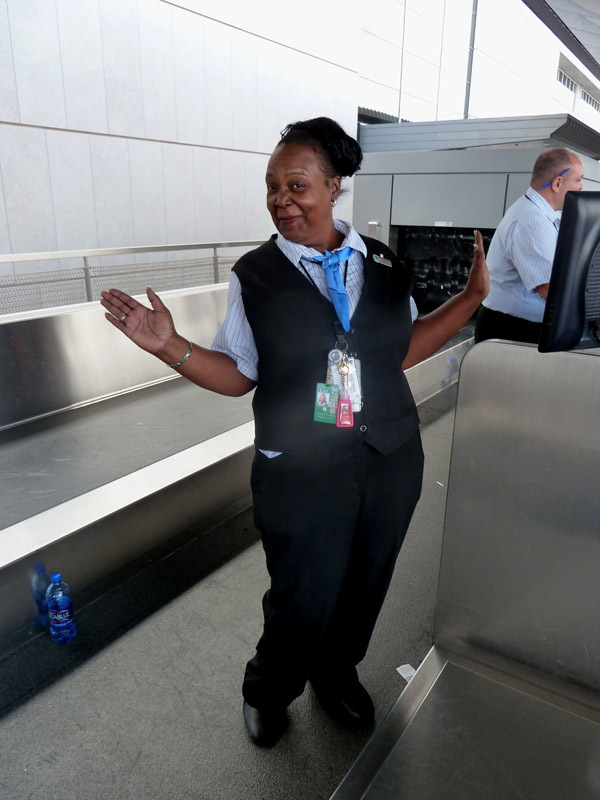 Photo: The wonderful West Jet receptionist who helped to smooth our entry into the airport and the unexpected delay. Unfortunately, she was not able to join us for drinks. Perhaps next time. 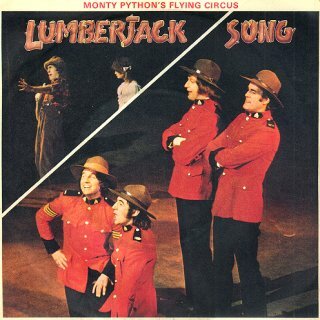 During the celebrations we managed to break into a version of our Monty Python favourite, “We are Lumberjacks” as explained earlier in this post. 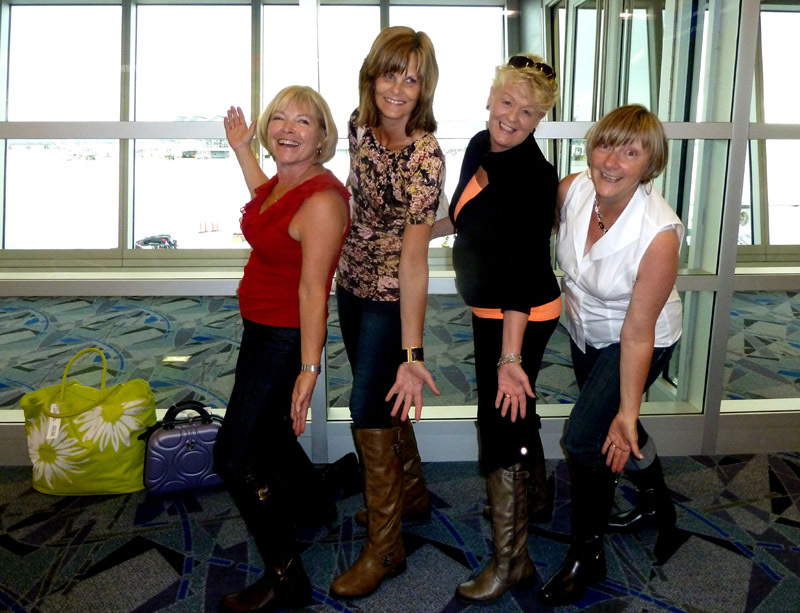 As a final bit of fun before our departure, we were visited by four Las Vegas Show Girls who, after changing behind a temporary curtain we hung in the lounge, gave us a few show stoppers. The girls just loved those amazing Canadian men (that would be us) and were determined to follow us back to Canada. Arriving at the Vancouver Aiport at 7:45 pm meant it was going to be nip and tuck as to whether we could gather our luggage, clear customs, arrange transport and make it to the ferry by 8:45 pm (9:00 pm was the last departure from Swartz Bay). Not to worry, after a few discreet words with another very helpful West Jet employee, Lynn returned with taxi vouchers to get our entire crew to the ferry terminal. We were off and running by 8:15, at the terminal by 8:40 and on our way home at 9:00 pm. As we settled on the ferry for a late evening meal, we first toasted West Jet and then shared more laughs about our experiences (which included a rousing rendition of ‘Sheri Baby’ by our own Jersey Boy – Jim), many will be remembered in the photographs taken aboard the Westesdam, in Astoria, San Diego and Las Vegas before our return home. Thank you Lynn McNeill for the all planning that helped to make our trip such a wonderful, worry free experience. 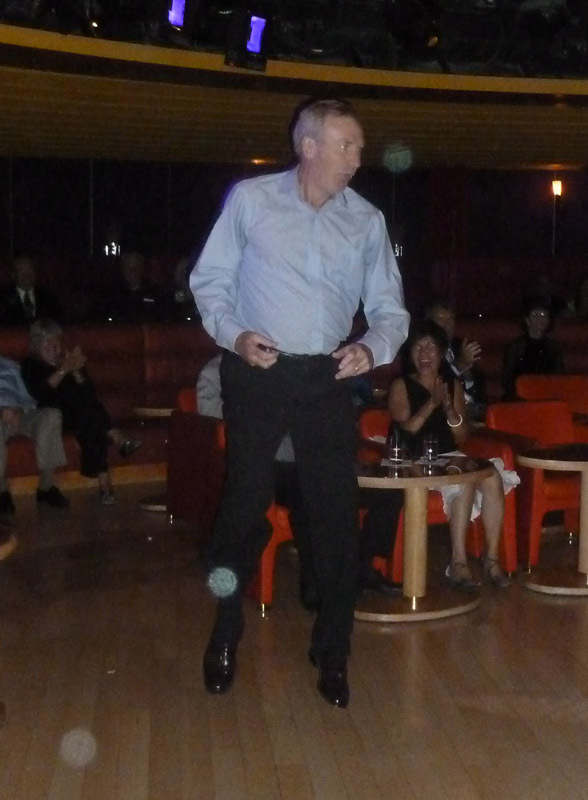 Perhaps a return engagement next year will serve to keep our group as the finely tuned party machine we became over the ten days of this Cruise to Las Vegas. at the airport after having watched one of our “We Are Lumberjacks” renditions. They desperately wanted to join our group and return to Canada. There were several offers in the airport from those who wished to give them a helping hand.